To celebrate Father’s Day we are offering for a limited time Half-Priced Gift Certificates to our Concealed Handgun Permit Course that you can give to a father on their special day. Actually they are fully transferable so you can also give them to any Father, Friend or Family member. 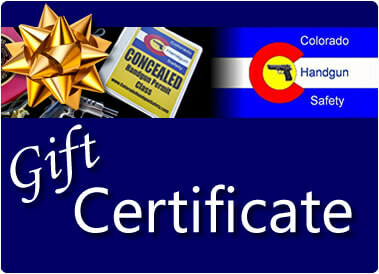 The Colorado Handgun Safety Gift Certificate is redeemable for admission a regularly scheduled Concealed Handgun Permit Course that we offer along the Front Range of Colorado. The Gift Certificates will be mailed via USPS to you as soon as we get your order. Gift Certificates are valid for one year from the date of issue for admission to a class, after one year the full purchase price may be applied to the cost of the course tuition for up to 5 years. The Certificates are Non-refundable but fully transferable to anyone you give them to. Order Now as Father’s Day is Sunday June 17th.